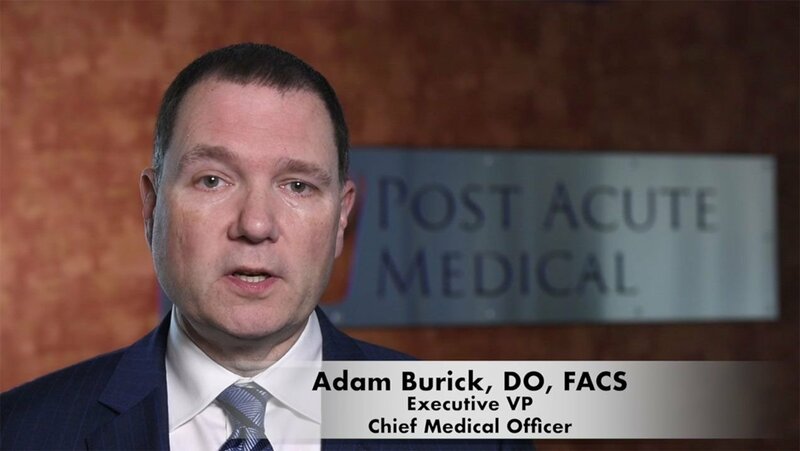 Dr. Adam Burick joined Post Acute Medical in 2014 as chief medical officer. With a true passion for exceptional patient care, Dr. Burick is responsible for all aspects of physician programs and management. His expertise and experience allows him to work closely with the members of his team and create new programs and processes to improve patient care. His main goal as CMO is to enhance patient care and experience through these programs, as well as engage physicians to care for the patients within PAM’s hospitals. Prior to this position, Dr. Burick had been in private surgical practice and had the opportunity to serve in various administrative positions at the hospitals where he practiced. These positions included the teaching of residents, serving on various boards, developing programs and hospital policies as well as hospital physician advisor. These experiences aided Dr. Burick in choosing a different direction in his career and the decision to give up direct patient care and become PAM’s CMO, allowing him to initiate these changes and advocate for patients and physicians on a larger scale. Dr. Burick is a graduate of the Philadelphia College of Osteopathic Medicine. He completed his internship at the University General Hospital in Clearwater, Florida and returned to Pennsylvania to complete a surgical residency and chief year at Pinnacle Health Hospital in Harrisburg, Pennsylvania. He worked in private surgical practice in Central Pennsylvania from 1999-2014, prior to joining Post Acute Medical. He currently resides in Mechanicsburg with his wife, an internist, and two sons.